We encourage our campers to travel to and from camp by the buses. All buses leave and arrive at the Westmount High School parking lot. Buses leave promptly at 2:00pm and return at 12pm. If you are driving your child to camp it is important that you arrive between 3:30pm - 4:00pm so that your child’s transition into camp is a smooth one. If you are picking up your child, you must notify the camp office at least 2 days in advance. Pick up is at 9:30am. If you have to change your child's transportation plans either before or during camp session, please notify the camp office immediately so we can make the necessary arrangements. NOTE: BUSES DO NOT WAIT FOR ANYONE! Has your child’s behavior changed since he or she returned from camp? Yes it has. She was a very shy little girl who did not have much self esteem. I have noticed a big changes; she is able to communicate more of her feelings as well as being more open to new ideas. I have also noticed more independence. 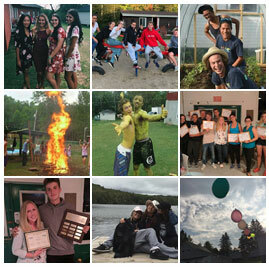 What great memory did you take with you when you left camp? At camp, I learned how to use my talents and skills to give of myself to others. Creating friendships and establishing trust with my campers was a heart touching experience. I gained confidence working with children of all ages including how to lead teenagers in becoming great camp counselors. There are an abundance of C.A.M. memories but one that I hold dear is the last camp fire of the session, when all the fun has been had and what remains is the goodbye the following morning with a smile on your face and tears down your cheeks. Your heart grows a little more each time as you hope to see those faces again soon. How was your child’s first time away? Thanks you to all the members of Camp Amy Molson for giving our daughter the experience of a lifetime. She couldn’t stop talking about all her experiences at camp! It was her first time away from home for such a long period and I truly feel she has matured in some ways and is more appreciative. 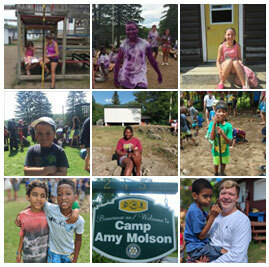 What has Camp Amy Molson taught your child? My daughter has experienced things at camp that she never would have done at home. She has good memories, she will never forget. My daughter has been going to Camp Amy Molson since she was 5 years old. She is now 11 years old. In this time she has earned many things. She swims very well thanks to the camp. She has also learned to be more independent which was hard to do at home as she was an extremely sheltered child. It has also taught her to accept other children for what they are, etc. Thank you Camp Amy Molson. The camp does not assume any responsibility for lost, soiled, or damaged items. All clothing and sleeping bags should be CLEARLY LABELED with the child’s full name. Many children find comfort in bringing along their favorite teddy bear or stuffed animal; again please make sure items are labeled. Your child may also want to capture their camping experience on film, feel free to send him/her with a disposable camera. Only send your child with enough toiletries to last the session. Most of the time, the child will not return with them. You can find travel sizes at the dollar store or pharmacy. Camp Amy Molson is not responsible for lost or stolen goods. Camp Amy Molson does not encourage bringing iPods, gaming devices, cellphones and things of this nature. These items are often misplaced or damaged and considering the high cost of these items, bringing them to camp is not advised. If you aren’t following us on Instagram or a fan of us on Facebook then you should be! By following our social media outlets you’ll be able to keep up with the latest news, pictures and information both during the summer season and off-season. Pictures are also posted on our Instagram and Facebook pages throughout the summer. This allows you to keep up with the action and maybe get a glimpse of your child having a blast. Q: How much will it cost to send my child to Camp Amy Molson? Q: At what age is my child eligible to attend camp? A: The child must be 5 by June 1st and no older than 15 by July 1st of the year he or she attends camp. Q: Should I send money to camp with my child? A: Children should not bring any money to camp. Q: What should my child bring to camp with him or her? A: Please see the Parents’ Handbook for a list of necessities. Camp Amy Molson provides an opportunity for our campers to enjoy the outdoors and benefit from a technology free environment. Therefore, it is not recommended that campers bring electronics such as Gaming devices, iPODS, portable DVD players, cell phones, etc. Camp Amy Molson is not responsible for lost or stolen goods. Q: If my child has any special needs, how should I proceed? A: It is crucial that you discuss your child’s needs with the Executive Director to ensure that the program can be modified to address their needs. In some situations it may be necessary to discuss with the other professionals involved ie. teacher, doctor. Q: Can I call my child at any time? A: Campers are not permitted to use the telephone. You are welcome to contact the camp if you have any concerns. Please understand that we are all busy caring for the campers, so we may not be able to return your call immediately. Q: Will my child be able to spend any time with their sibling throughout the day? A: Campers are divided according to age and generally not placed in a cabin with their siblings. Camp-wide games and activities take place after supper, which is a good opportunity for siblings to spend time together. ATTENTION PARENTS OF 2019 CAMPERS!!! Fill out the survey in order to have a chance at winning a free summer session. It’ll take two minutes and help us to continue to create an amazing summer holiday for your children!